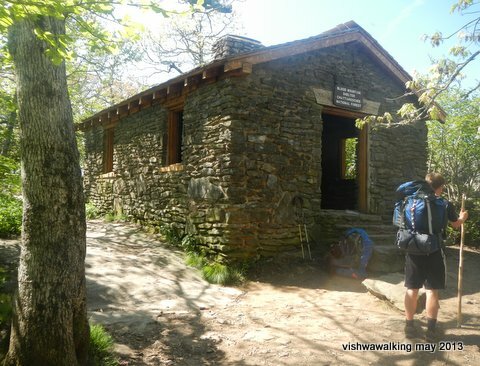 Stover Creek (mile 2.8) to Gooch Mountain Shelter (mile 15.8). 13 miles. One of the joys of the trail is the people you meet on it. I left Stover Creek, heading for Gooch Mountain Shelter 13 miles away. I soon found a walking companion: Andrew, a 20-ish student with a walking pace similar to mine. There were a few ups and downs, but really this section has no horrendous climbs or drops. As mentioned elsewhere, watching elevations is crucial to how far a walker can go in a day; in the Appalachians this lesson is driven home in no uncertain terms. That's not to say that Hawk Mountain, followed by in quick succession by Sassafras and Justus Mountain did not exhaust me in the extreme as I struggled to find my hiking legs. Andrew was travelling with two young females. None of them had hiking experience. I pointed out poison ivy to them. None of them were familiar with it. The women particularly had moved off the trail into the forest to relieve themselves. This could be an extremely uncomfortable action if you can't identify poison ivy. There is a huge amout of poison ivy lining parts of the trail, but it is easily avoided if you recognize it. We soon left the women behind, which didn't seem to worry Andrew unduly. I spent a pleasant day exchanging life experiences with Andrew. We drew into Gooch Mountain Shelter (mile 15.8) in the early evening. Throughout the day, we kept passing and repassing a hiker named Feather. She was very friendly and incredibly fit and shot past us even on the hills, but then returned to help her much slower companions. As her companions dropped back, we saw her at greater intervals. At Gooch, Andrew made preliminary preparations setting up his tent and headed back to find his companions. I talked with other hikers about the family I had met the night before, who were also headed for Gooch. Apparently they had left their camp late in the morning and had turned back after an hour or so. When Andrew returned with his friends, the women were distraught. Feather had helped them with their packs. Apparently they had spent some time on one of the mountains (probably Sassafras), over a couple of miles away, wondering whether to go back or to wait it out until help arrived. One was in tears. They disappeared into their tent. In the morning, they were still asleep when I left. I got reports later that they had gone back down the trail for home. With the best of intentions, sometimes the trail can be a rude awakening for hikers not ready for what it has to offer. Next day, I started off from Gooch Mountain Shelter with Jeff, a hiker from Tennessee. Partway through the day, we linked up with Joel. He left us at Woody Gap (mile 21) to head home. Our walking paces were similar so it worked. Jeff was a good-humoured companion with a beautiful rich accent. As we walked we planned how to move through the next stage, which required a bear canister. Between March 1 and June 1, 2013 (and probably for the same time for years to come), campers require bear-resistant canisters between Jarrad Gap (mile 26.7) and Neel Gap (mile 31.7). Left: The Blood Mountain Wilderness is part of the Chatahoochee National Forest and stretches very roughly to the east of the trail from Woody Gap to Neel Gap. The trail moves along it's western edge. I carry a "Ursack," a soft bag that is advertised to be bear-resistant (the same terminology used to describe canisters). However, not knowing what the Forest Service saw as an acceptable bear-resistent container, like most people, I decided to cross the area that required the canisters without camping. That meant camping as close to Jarrad Gap (mile 26.7) as possible. Many of us settled on Lance Creek. There is no shelter at Lance Creek, but there is good water and decent campsites in a thin strip of ground just off the trail. It was a popular stop. At Gooch, there are bear cables, so slinging your food and other potential bear edibles into a contaner and hoisting it aloft is a simple matter. At Lance Creek, campers worked cooperatively to set up several bear hangs. Again I was impressed with the way people worked happily together to set up a safe camp site. After Jeff and I had set up, two brothers breezed in. They had walked/run about 25 miles, but were not happy with their day's efforts. They were shooting for a 50-mile walk. Marathoners, who were pushing to do the entire trail in a couple of months. I met two other campers, Madison and Walkabout (their trail names), who were travelling solo. I also met Mission Man, who was travelling with a companion. In the next few weeks, our travelling lives would be inextricably intertwined. 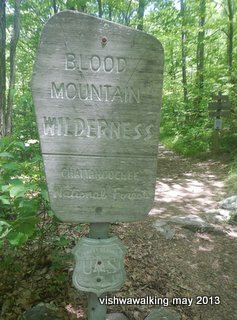 On the evening of the 26th, many people spoke of the difficulty of climbing Blood Mountain the next day. Jeff and I set off at a reasonably early hour and indeed, the day was a long one. From Lance's Creek, the trail is a constant climb with only a few downhill breaks. Then the Blood Mountain climb makes for the first really serious uphill climb (which is not to denigrate the Hawk Mountain and Sassafrass Mountain climbs of a couple of days earlier). It's a 1,581-foot climb from Lance's creek to the top of Blood Mountain. There are longer climbs to come, but this one did put me to the test. Jeff was not up for the climb and took the Freeman Trail, which skirts around the eastern side of the mountain at mile 28.2 at Bird Gap before rejoining the trail at the 30.6 mark. The Blood Mountain climb seemed to go on forever, but it's does not have any extremely gnarly bits to negotiate. Blood Mountain is the highest point on the Georgia section of the trail, at 4,461 feet. The final ascent to the stone building at its peak is a pretty sight for sore feet. The building was built in the 1930s. According to the official guidebook, it may have been built by the Civilian Conservation Corps (one of Roosevelt's new Deal projects to make work for unemployed, unmarried men between 18 and 25 years of age). 1) settlers moving westward in turn pushed natives westward, resulting in a blooddy clash in the 1600s between Cherokees and Creek Indians. 2) A battle between Cherokees and colonists as the latter increasingly invaded their land. 3) the reddish lichen that covers rocky sections. Today, the mountain is the most visited spot south of Clingman's Dome. The official guidebook says 40,000 people visit it a year. 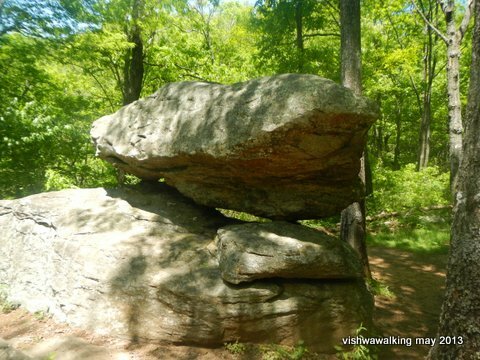 I visited on Memorial Day weekend and the trail was awash with day hikers and weekenders. May 27, 2013 was a beautiful sunny day, not too hot. The view is spectacular. The trail winds through the forest, so you can go hours with only glimpses of the rolling hills that you are in the midst of. For campers, it's not the best spot, although there are eight tent pads if you find the stone building too claustrophobic. There is a privy, but no bear cables. There's no water for some distance and fires are not allowed. Available firewood is scarce, and it's particularly so on Blood Mountain. I'm relatively indifferent to campfires (they're nice, but sometimes the effort in overused areas is too much for me to bother), but they are hugely popular in general. People will go to a great deal of trouble to create a small fire after a long day of walking. Because of the bear canister rule (see above) the area is not quite as popular as a camping spot, which is a good thing. It's overused for sure — but a must-see if you're on a thru or section hike. It's only 2.3 miles from the peak to Neel Gap, but heading down the mountain is in many ways tougher than going up. It's steep, with many rock drops that challenge tired legs. I found that my toes got a beating with the constant sharp downward push. Take care on this section. 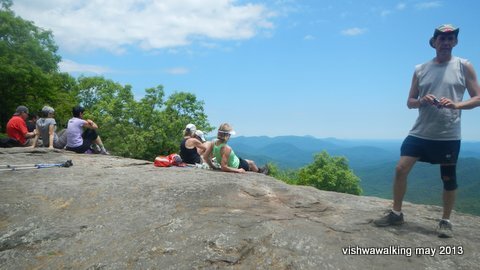 Most day hikers get to the mountain from Neel Gap, so on Memorial day, there was a steady stream of hikers of all ages trekking up the mountain. Be prepared to give constant estimates as to how far away the peak is. At mile 31.7 hikers meet Highway #19 at Neel Gap. Across the paved road is Mountains Crossings, a store with basic food, but no serious groceries for hikers. However, for $15 there is a bunkhouse for hikers — a shower, a laundromat (for a few bucks extra) and a mattress were very welcome. Commanding the bunkhouse is Pirate. He's a character for sure. He makes an evening meal and a breakfast for a "donation." The going rate seemed to be about five dollars. It's well worth it. My suggestion is to get to Neel's Gap as early as you can. That way, you can clean up, lounge about a bit and nurse sore muscles. I snoozed in the bunkhouse for a couple of hours in the afternoon and it felt like luxury. I remet Madison, Walkabout and Mission Man, as well as a few others at Neel Gap, but we were not yet working collectively. One young runner, Arthur, had clocked up some amazing achievements in his high school year and was moving down the trail at an amazing speed.